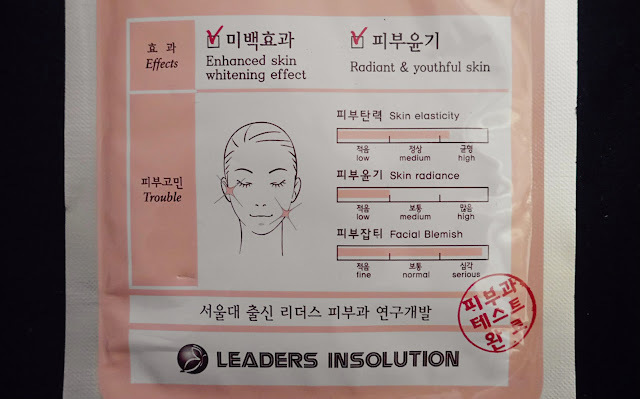 Leaders Insolution is a Korean brand created and tested by a group of dermatologists. There are 17 variations in the range. 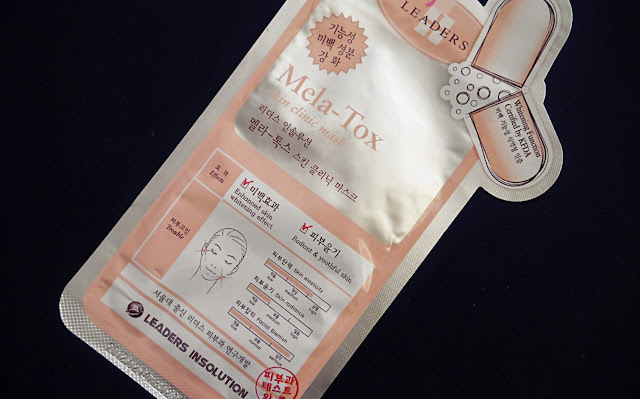 Mela-Tox is their top seller - it's main function is whitening. Description "helps you get back that radiant, youthful glow. It brightens dull complexions by suppressing melanin production which causes pigmentation problems. The mask also moisturises and diminishes blemishes." I like that the packaging clearly states the function/effect of the mask, what corners it helps with and the skin type it is suited for - makes it easy for user to identify which mask would benefit their skin the most. The pill detailing is cute too. 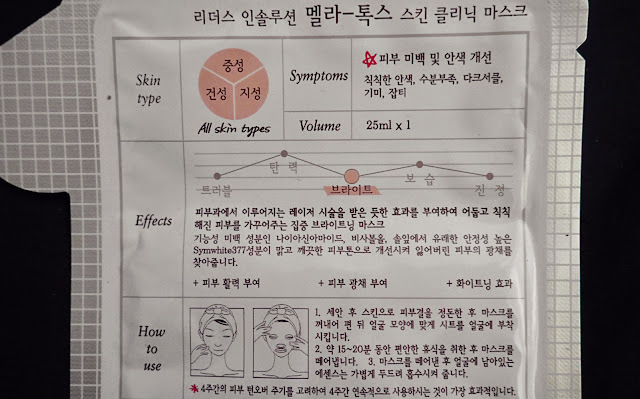 The mask was not lined with plastic - I'm starting to notice a lot of Korean sheet masks don't. The sheet is made from silk cellulose and the size of the mask was perfect for my face - fitted very well and did not slide. This is key factor as it enables maximum absorption without essence dripping. The scent of the mask was very subtle and does not linger. The essence was thicker than regular mask - which hydrated and plumped my skin very well. When you take off the mask it leaves a gel film behind, I'm not sure if it supposed to be an protective barrier? It's quite sticky and takes a few minutes to dry and absorb in. 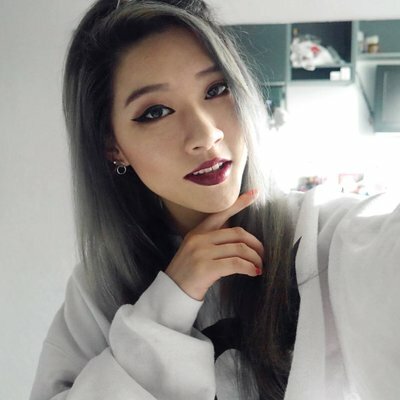 After 20 minutes - my skin was significantly brightened, it looked clear and radiant like kpop celebrities waaa~ *^* Temporally rid my blemishes too, need to constantly use it every week to maintain the results and "suppress melanin production". The results were very impressive! I recommend this for people with dry or normal skin more. I have oily skin and I think the essence may a bit a little too rich for me, since I had a few little pimples the following days after.